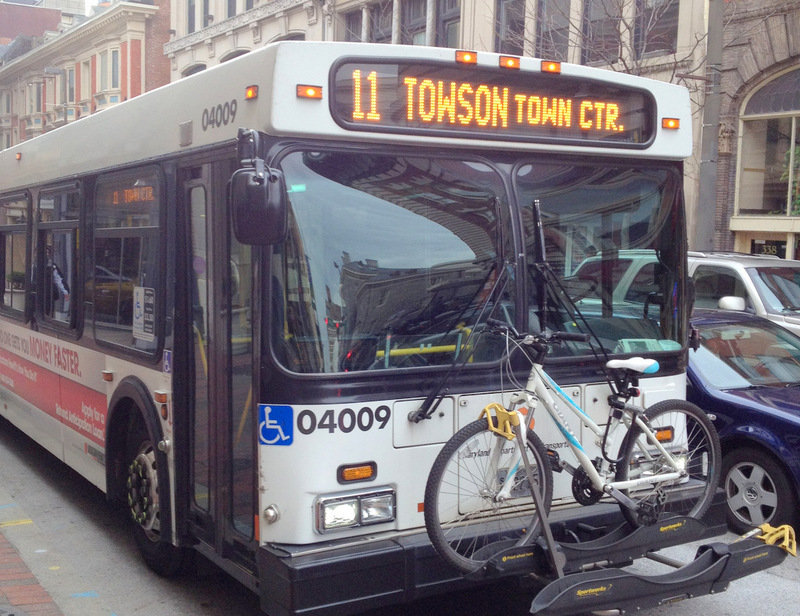 Above: City buses in Baltimore are run by a state agency, the Maryland Transit Administration. Yesterday my passion for living car-free in Baltimore died. From the beginning, I knew the decision would take commitment and a good deal of extra effort. But I was always prepared to face the challenges of late buses, rainy mornings, and bitter cold walks from my stop to my door. They were annoyances I was willing to endure because of my choice to make mass transit work as a viable solution – my small contribution toward a more sustainable and successful Baltimore City and a better overall me. What unfolded yesterday morning, however, was different. It was the last straw in a run of headaches and frustrations that make the Maryland Transit Administration buses, for me, an unrealistic option. As I sat waiting on the MTA-provided bench at the Fleet and Albemarle streets bus stop for the No. 11 bus at 9:08 a.m., I was getting a jump start on the day’s emails and appointments with my smartphone. As I heard the familiar sound of the bus approaching, I looked up to watch the No. 11 continue right past me without ever slowing down. I jumped up and chased the bus on foot – in my work attire and carrying my work bag – and actually managed to catch up to the bus at a red light about one block from the dedicated stop where it drove right past me. As the bus was stopped at the red light, I knocked on the doors to be let in, but instead the driver looked at me through the glass of the doors and yelled, “Next time stand up!” Then he drove away, leaving me standing in the street. I love and hate the No. 11 route. Finding myself standing and waiting for 15, 20 and even 30 minutes on those cold winter mornings or rainy days has never been enjoyable or practical, but those types of days are par for the course. They’ve always been balanced out by other mornings when the bus would simply arrive as scheduled and the world seemed too easy. There is also a strong MTA rider presence on Twitter, which I’ve joined in on. We Tweet updates on bus timeliness, service issues, etc. And believe it or not, it’s not all complaints: lots of kudos are given when it’s been a timely week or there’s a particularly good driver. Some of the MTA’s new technology has allowed me to nominate my favorite driver for MTA Driver of the Year through “Rate My Ride” and I partake in Rate My Ride several times a week through text messaging. What stings the most is that through it all, good days and bad, I’ve always endorsed the MTA and encouraged others in my peer group and family to ride the bus to work. There were times when I’ve even gotten downright smug about living car-free in a city where people think I am crazy for even trying. There were even moments when I felt that maybe the tweets, Rate My Ride scores and word-of-mouth were actually helping to make the MTA more reliable. It all became a point of pride for me. But after yesterday, I’m giving up. I was prepared to cope with all the regular headaches of mass transit, from the weather to the waiting, but not for the MTA to willingly throw frustrations at me. Isn’t it MTA policy to stop at bus stops when there is a passenger waiting, seated or not? But even that isn’t the issue. What frustrates me beyond all else is the lack of common decency and humanity that this driver demonstrated toward a paying customer. Is it MTA policy to yell at passengers, “next time stand up,” through closed doors, then not allow the passenger to board after they’ve chased your bus and gotten to the door? I know there are unwritten rules and visual clues riders give off that tell the drivers they are waiting for that bus, and 99.9% of the time I am ready with my Charm Card at the curb. What he did was mean-hearted. No business, not even the MTA, can hope to survive with that kind of employee or that kind of service.